Developing the flight sim our team itself seems to be turning into a train simulator: after the locomotive is warmed up with technology development, the speed of adding new content is increasing so rapidly. It means this time not only Albert but also I can please you with some long awaited good news. As we promised you’ll get IL-2 and all its modifications including the rear gunner on the nearest early access session. Note, that it’s not complete yet, for instance, a lot of gauges are disabled, and the skin armoring may be not 100% correct. Updates to complete the aircraft will be applied over time but in general IL-2 is ready for early access. Also, several missions for this plane have been designed for you to try it out in various combat situations, so I congratulate you with this new flying beast! Instead of teasing you with Ju-87 release date, I’d rather tell you about fresh fixes and additions. Let’s start with AA crews that were sent for extra training course which means that: a) they are better shooters and more dangerous to incautious pilots; b) they inevitably die if you shoot them, bomb them, or behave somehow hostile. By the way, bomb and rocket explosion effects have been improved so the destructive mightiness of you brand new IL-2 is now even more impressive and realistic. Another addition that shows our warm care about the AA crew guys is that the Germans now have searching lights to hunt down LaGGs in the night sky of Stalingrad region. At this version they can be found near the Lapino airfield which you already love, I believe. Furthermore radio comms have been reworked to make them sound clearer and help you to realize where and why you may need to fly. Some optimization has been made, to be certain, smoke domes above Stalingrad should now show better performance. And here comes pleasant news for aesthetes and those who prefer manual mixture control - exhaust flames color now varies depending on the mixture saturation. This is far not all that we’ve prepared. We plan to tell you about everything that we’ve brought to you by the 12th week of early access later today in a live stream. Loft and I will share with you all interesting and useful data about in-game IL-2 and we’ll answer your questions in the chat of our Twitch channel. Broadcast starts at 16:40 GMT. P.S Happy Valentine's day! It does not matter if you’re in love with a nice person, or your job, or one brilliant flight sim about Stalingrad - let this day bring you more joy and delight. Great news! Can't wait to try this version, everything look speeding up in a very good way! 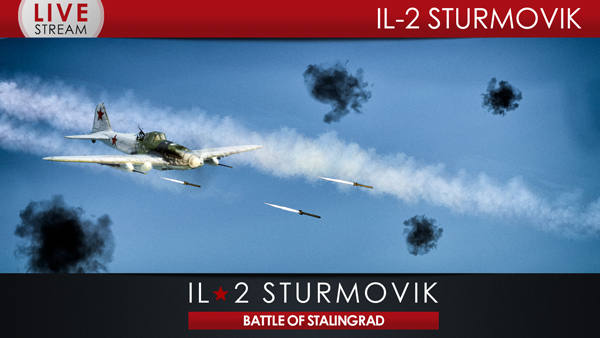 The long awaited IL-2 Sturmovik is finally here! Can't wait to test her out. All I can say to the devs is, BRILLIANT! > exhaust flames color now varies depending on the mixture saturation. Is this cosmetic stuff more important than working gauges and trimmers etc.? I hope that they do not get stuck to improve minor stuff but forget to fix the BASICS. The planes are not ready, the MP is not ready, while really unimportant things get implemented? Maybe they should revisit the priority list. So much of basics still missing and not to be added as it seems. Keep pushing, devs! Am really curious if the CTD issues reported in the Installation&Perfromance thread are adressed. Great news. I can hardly wait to try out the new IL-2. Nice to know the Stalingrad smoke columns have been tweaked to improve performance too. Lordy, who woke up Mr Grumpy? Sounds good, but what's the word on QMB? Seems to have gone kinda quiet around that. No, they said QMB in Feb. Plenty of time. It's just simplier than tuning the gauges, and done by different specialistss. As you may remember, we've been splitting the priority between MP and QMB. Eventually MP won, so first of all we're preparing multiplayer for the early access, then QMB. Woot woot! Thank you guys, you did a great job again! It's so nice to see this sim get better week by week. I was not expecting Stoichiometry as a feature. .
Development is progressing nicely, I'm looking forward to today's update! Also i am very much looking forward to flying the IL2. One question if i may ask. Is there yet any news on Skintemplates and the skinviewer? Great, sounds we'll get those new armament commands! Another sweet weekend and onboard the IL-2. Especially because stormy weather forecast and staying indoors. Only way out is to fly fly fly. Propably the plane I'll have the most fun with is arriving. Woohoo!!!! The exhaust flames are a nice little touch. Unlike some, I really don't mind that the little details sneak in between the big stuff. You're the ones developing this sim, you best know how to make the most of your work force at a given time. Looking (or rather hearing) forward to the new comms. I generally like the VVS ones, but the German ones have been in need for some lovin'. It looks like after today, it's a whole new war. Can't wait to try the iL2. I'm loving the attention to detail that you are still thinking about and working on. I'm glad that you aren't skipping the little details that will make this game what we are all dreaming it to be. Great News, can't wait, a german pilot might have said "... ich bin gespannt wie ein Flitzebogen". Thank you and happy Valentines Day. And my computer spat the dummy this morning... damn... Enjoy yourselves! Post some gorgeous screenies! Another working weekend for me. Might be a while until I get to try the Il-2 out. Make sure you use that printscreen button chaps! Maybe this update happened earlier, as I haven't been testing in a while, but what I really find amazing this time is the interaction with TrackIr! I have NEVER felt so "being inside" a cockpit as I felt this time! Stunned, amazed and loving your great work! !